“TŌMIN“ is a liquid freezing device enable to freeze foods more quickly, Food product immerses in frozen liquid (ethanol). 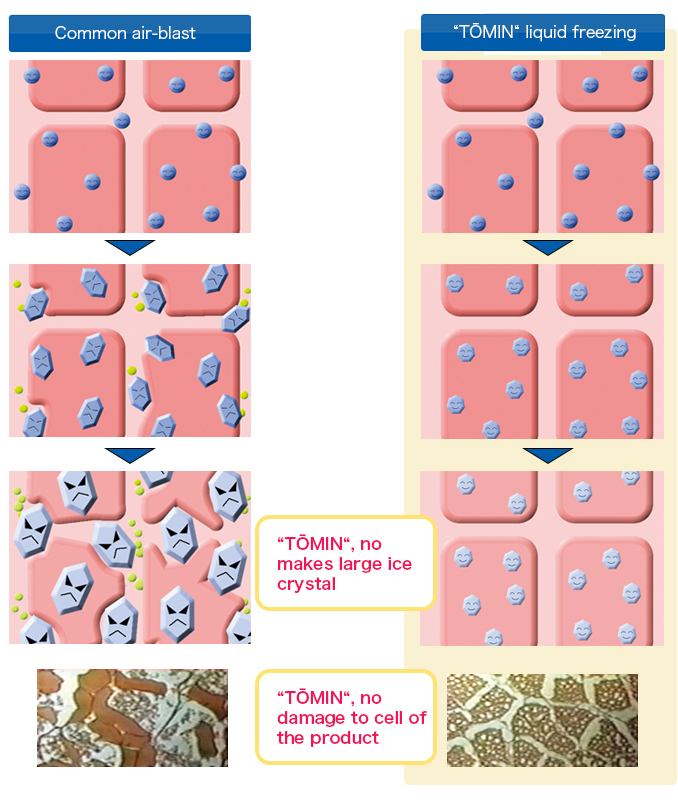 This is new freezing method against common air-blast freezing system. The freezing with absolutely no organoleptic variation to the food products. Why does the difference of such a quality occur? 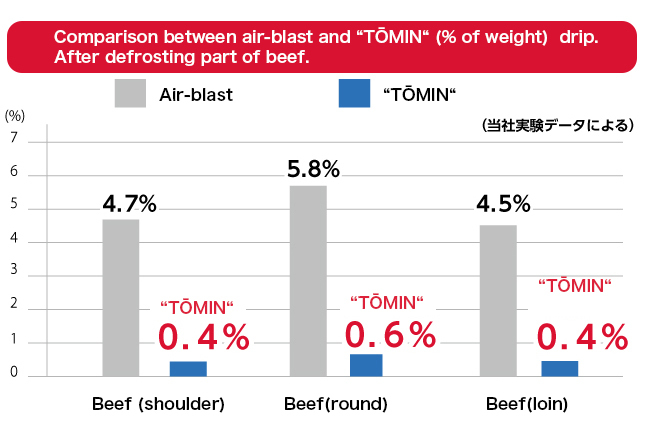 “TŌMIN“ liquid freezing system enable almost same fresh product after defrosting. The difference also appears remarkably in the drip amount data. 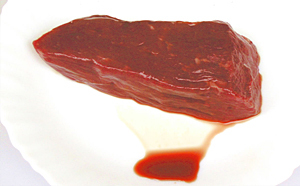 drip contains a lot of nutrition, (protein, amino -acid and vitamin etc.). If the nutrition loses from the foods, deteriorates these quality. 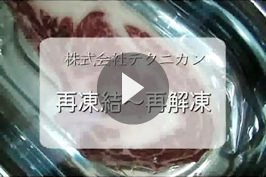 ①Please pay look to the state of the surface of beef which repeated freezing and thawing. The thermal conductivity of the liquid yields a 20-fold increase in freezing speed the speed needed to obtain micro-crystallization and avoid cellular damage. 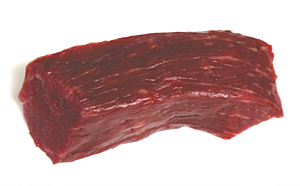 moisture, without loss of flavor or juices. 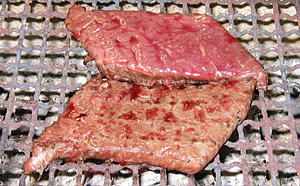 Incredible results in all facets of food quality. taste, texture, color and fragrance. The space required for a “TŌMIN“ unit is 1/6 or less than a conventional freezer. “TŌMIN“ reduces the strain on workers by eliminating the need to work in a refrigerated environment. Freezing is easily accomplished by a simple touch of the button. 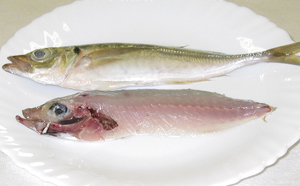 Besides the freezing of meat, poultry and seafood, “TŌMIN“ is suitable for freezing a broad range of foodstuff such as processed foods, preleavened products and prepared foods. Powerful & versatile freezing extends the shelf life of food and makes it possible for long-term storage, and better stock management. 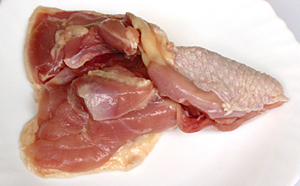 Defrosting can be carried out at any temperature with no other special requirements. The ethanol contained in the freezing fluids are a volatile material, but at temperatures below -8℃ to -10℃, volatility is reduced and no evaporation occurs. If the unit is idle for a long time, it will automatically maintain the temperature at -10℃ to -15℃　in order to hibernate the freezing fluids and minimize the freezer running cycle. Fish roe from seasonal catches like salmon can be frozen in bulk with no loss of shape or texture after defrosting. 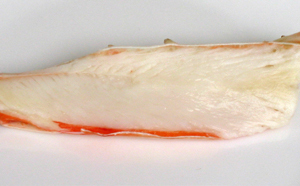 Japanese delicacies such as whipped yamaimo (yam) and similar foods can be frozen and defrosted in portions as needed. 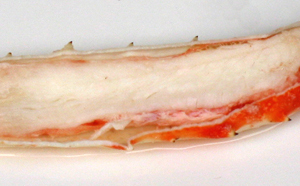 Customers can be offered short-shelf life appetizers such as sashimi (sliced raw fish) and crab with “newly-caught” freshness and flavor. 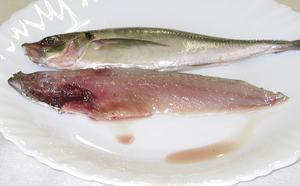 “TŌMIN“ Liquid Freezer is also ideal for previously un-freezable delicacies such as terrine and foiegras. 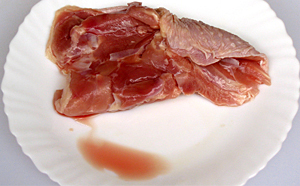 Tempering (freezing the surface layer of ham, meat, etc. 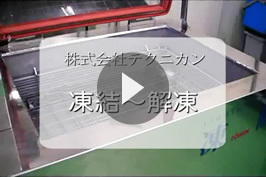 for easier slicing) can be quickly and easily achieved using a “TŌMIN“ Liquid Freezer. This process reduces meat wastage during slicing and the product is not prone to temperature rises after packing in trays, which helps retain flavor. 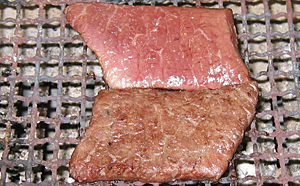 Time consuming preparation dishes such as Korean Yukhoe can now be made in advance and frozen. By defrosting on demand, restaurants can offer this spicy delicacy whenever they wish while making more efficient use of their time. In addition, the “TŌMIN“ Liquid Freezer can be deployed in an array of businesses, including marine product and meat processing plants. Voice from customer who introduced from this. You can see the freezing report of various materials here.